Since the colonial era, lighthouses have guided mariners on the Chesapeake Bay. Although many structures have been destroyed or dismantled over time, scores of lighthouses, range lights, towers, buoys, and other navigational aids remain. 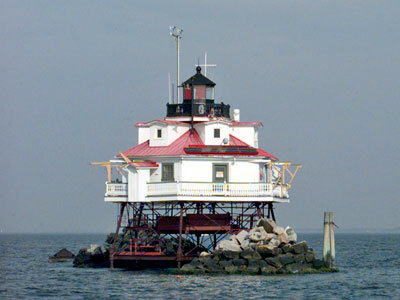 Chesapeake Bay lighthouses include integral, caisson, screw-pile, and skeletal tower designs. A few structures have been relocated, restored, and opened to the public as museum exhibits. Others have been decommissioned, but remain standing at their original location as historic sites. Several lighthouses remain in active service as navigational aids. Active lighthouses in the Chesapeake Bay are listed in the United States Coast Guard’s LIGHT LIST Volume II ATLANTIC COAST Shrewsbury River, New Jersey to Little River, South Carolina.